Innovations bring a maze of complexities to a sport, but elevate the performance level of an athlete and reduce the chances of injury, making sport more enjoyable for the spectators and the athletes. The world of competitive sport is highly influenced by even the minute changes in sports equipment, which could be a matter of winning or losing. In recent times, the sports equipment industry has emerged as a sophisticated yet commercially viable hi-tech industry where advances have revolutionized sports. Additionally, various world-level championships like Olympics and World Cups have popularized the sports equipment industry up to a great extent, making it a lucrative business opportunity for public as well as private venture capitalists. The degree of competitiveness in sports has been remarkably impacted by nanotechnology like any other innovative idea in materials science. 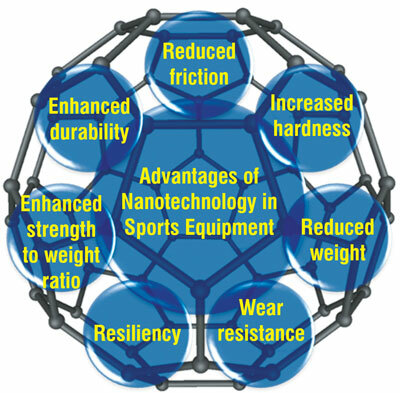 Within the niche of sport equipments, nanotechnology offers a number of advantages (Fig. 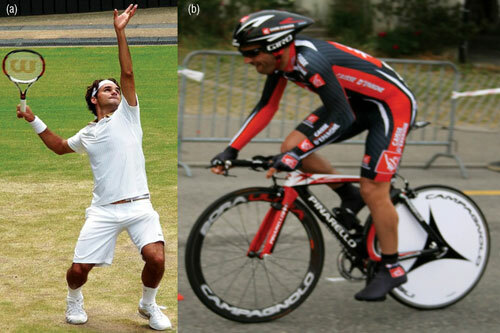 1) and immense potential to improve sporting equipments making athletes safer, comfortble and more agile than ever. Baseball bats, tennis and badminton racquets, hockey sticks, racing bicycles, golf balls/clubs, skis, fly-fishing rods, archery arrows, etc. are some of the sporting equipments, whose performance and durability are being improved with the help of nanotechnology (Fig. 2). Nanomaterials such as carbon nanotubes (CNTs), silica nanoparticles (SNPs), nanoclays fullerenes, etc. are being incorporated into various sports equipment to improve the performance of athletes as well as equipments. Each of these nanomaterials is responsible for an added advantage such as high strength and stiffness, durability, reduced weight, abrasion resistance, etc. in sporting equipments as listed in Table 1. Various companies in the area of sporting equipments are coming up with innovative technologies/products, which include Double Core™ & BLX™ by Wilson (tennis), Air D-Fence™ & Nanolok™ by InMat (tennis), nano-CFC® by Holmenkol (skiing), N-FUSED™ by Easton (archery), NSi™ from St. Croix (fly-fishing), Nanopreme™ by Yonex (golf), etc.Over the years, with the evolution of materials in sports equipment, there has been reduction in the weight of equipment accompanied by considerable improvement in its strength. 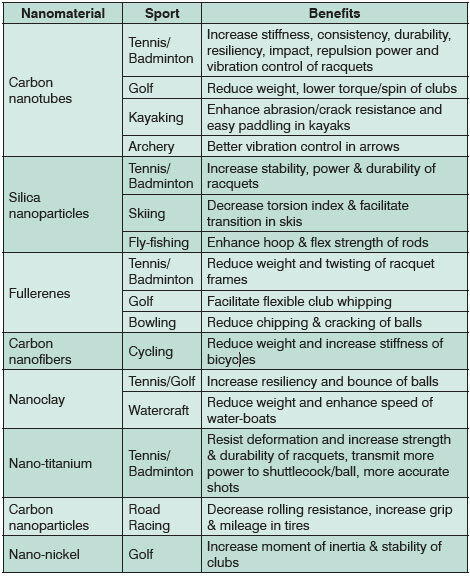 CNTs, the most frequently used material in nano-enhanced sporting equipments have a higher specific strength and specific stiffness than other conventional materials (Fig. 3). They are 100 times stronger but 6 times lighter than steel and as stiff as diamond, which make them an ideal component for making sporting equipments where low weight and high strength are of prime importance. Additionally, various nanocomposites incorporating CNTs are far superior in terms of strength and durability to other conventional materials used in sporting equipments. CNTs are being used to create super-strong handlebars for mountain-bikes, durable tennis racquets and ultra-lightweight bicycle frames. Many champion road-racing cyclists such as Cadel Lee Evans and Floyd Landis won various tournaments including Tour de France using bicycles having CNT incorporated plastic frames. The BMC SLC01 Pro Machine bicycles used by these cyclists were manufactured by the Swiss company, Bicycle Manufacturing Co. (BMC), which weighed just 1055 grams (size 51), but possessed 400 times greater tubular strength than steel1. The famous tennis player, Roger Federer has won many tournaments including Wimbledon using nano-enhanced racquets (Wilson nSix-One Tour 90, nCode & K Factor) reinforced with SNPs. These racquets are more stable; stronger and have 22% more ball-hitting power than other non-nano based racquets2. SNPs also impart flexibility control for skiing, allowing much slicker rides and turns.Equipments such as footballs/tennis balls with nano-clay lining as a barrier material uphold pressure for a longer game-play. 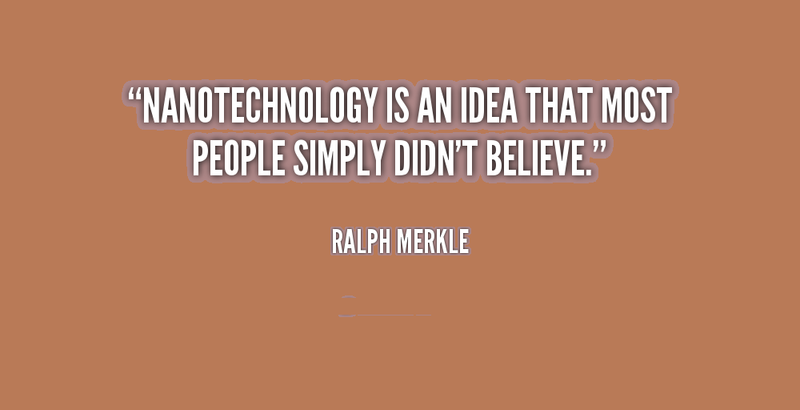 Incorporation of nanomaterials (e.g. fullerene) lightens the golf clubs by lowering the centre of gravity, which increases the power and accuracy during the game-play. Graphene oxide and buckypaper (sheet of CNTs) are incorporated into canoes or race-boat hulls/masts to increase glide while making them stronger and much lighter. In ice-skating, ultra-hard nanoceramics make the edges of skates super-sharp, whereas self-assembling bionic nanoparticles are used in land speed cars (Royal Purple Streamliner from Nish Motorsports & Nanotec-USA) to improve the fuel economy and speed even with 50% less nitro methane fuel mixture3.In Formula One Motor racing, where race largely depends on the motor body-weight and type of tyres, lighter-weight and better-wearing nanocomposite products are being seized upon. Also, nanoparticles of ZrO2, ZnO, CuO, etc. are used in lubricants for reducing wear and friction, carbon nanofibers are being incorporated in breaks and nano-based paints are used for thermal resistance and aerodynamic drag reduction. Additionally, nano-phosphate lithium ions batteries (Nanophosphate® from A123 System’s, USA) are used in kinetic energy recovery systems (KERS), which are lightweight, have better charge/discharge capacity and efficiency. In 2011, the global sports equipment market was around US$ 64.9 billion and is expected to grow at 12.2% to achieve a value of US$ 72.8 billion by the year 2016. The biggest share of this market is the segment of ball sports equipment having 23.7% of the total market value. Japan, France, UK, Germany and USA are the major markets for sporting equipments where USA itself commands 40.6% share of the market4. Among various nanomaterials, CNTs are the most prominent nanomaterial being used in nano-enhanced sporting equipments such as golf shafts, rackets, skis, snowboards, etc. In 2011, the global market of CNTs (various grades) was around US$ 192 million and is expected to grow at a CAGR of 22.4% to reach US$ 527 million by 20165. Sporting equipments is one of the prominent sectors of CNTs market and constitute around 14% share of total annual consumption of CNTs, which is likely to be converted into a more significant figure in the near future6.Sports equipments, which are even 10-20% more enhanced in terms of performance/durability become better selling items in the market and nanomaterials may make some of the sports equipment perhaps many times better. However, despite the various advantages proposed, there is not a myriad of nanotechnology-enhanced sports equipment in the market as the technology is highly expensive and complicated to deal with. The price of CNTs, the most common component material of nano-enhanced sporting equipments, is around US$ 80-120 per kg7 in the market at present, which is quite expensive. Also, manufacturers will have to get new machines to produce nano-enhanced sporting goods. Sports industry personnel are still trying to figure out the actual demand of these products and how to pitch them in a right way. Most of the sporting products, enhanced with nanotechnology are sold at upper end price in the market that makes them widely inaccessible for every sportsperson. For example, Maruman Exim Nano golf clubs have a list price of around US$ 600 in the market in comparison to a regular golf club that may cost somewhere in between US$ 100-200. However, it is expected that over a long-term, these products will become less expensive so that each and every sportsperson could afford it. The global use of wrinkle and stain resistant nanofibers in cost-effective mass-market sporting clothing lines is an excellent example of the future prospects of nanotechnology in the sports equipment industry.